The first question to answer here is ‘what is a viola da gamba’? It is an ancestor of the cello, gripped between the players knees and played with the bow. Although it was used mostly as an ensemble instrument to begin with, Bach, Abel and other composers began to write for it in more of a solo capacity. 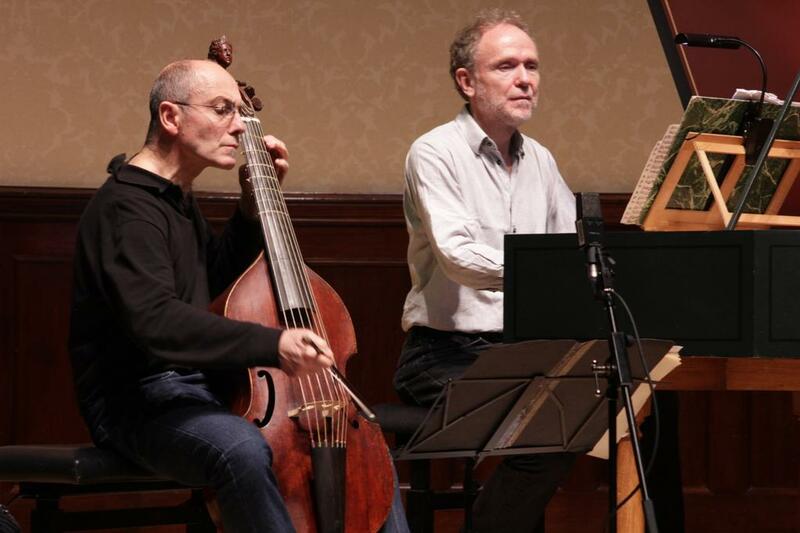 The instrument used by Paolo Pandolfo in this concert has seven strings, and dates from around 1700. There is no ‘spike’ on the instrument, so the player has to grip it with their knees. Pandolfo himself came to this music initially from jazz, bringing with it his own talent for improvisation. These are engaging and often stylish performances. Paolo Pandolfo and Markus Hunninger have a long-established chemistry in this repertoire, and their experience allows them to tastefully improvise within the confines of the written music – as the composers would wish them to do. Pandolfo’s quiet playing in particular is sublime, and I found myself instinctively leaning forward on occasion to catch his insights. The freedom he lent the Abel pieces made them sound like brand new improvisations. On some occasions I did feel this improvising was a little overdone, and that in the Bach especially the slow movements would have benefited from a ‘less is more’ approach, as the pulse was almost lost at times. In the faster movements however the dialogue between the instruments was a constant joy, their enjoyment of the music clear to see. 7:29 – the bright, vivacious second movement begins, using the upper register of the viola da gamba’s range. The crisp harpsichord right hand often trades melodic ideas with the gamba. 11:17 – a thoughtful slow movement, now in a ‘lower’ key (B minor) that brings out the resonance of the instrument’s lower strings. Pandolfo plays with great poise here. 23:29 – the first of Abel’s six pieces has a free, improvisatory feel – which I assume to be Pandolfo’s license with the piece rather than an absence of bar lines. The bow flits between strings and the quiet moments are exquisitely found. 25:36 – Pandolfo secures an extraordinary bit of ‘skating’ here (not a technical term! ), the bow rushing across the strings but somehow making all the notes coherent. 27:39 – this piece starts with pizzicato (plucking), which sounds unusual on the gamba, before short pieces of double stopping, culminating in the lovely passage at 31’15”. The performance here feels quite mannered, but on saying that Pandolfo does bring the composer’s thoughts off the page, making them feel fresh. 32:18 – again we hear the higher register of the viola da gamba, and Abel writes for it in such a way that it provides the accompaniment as well as the melody, thanks to lots of double stopping. There is an extraordinary passage of music from 34:12, the music rushing almost out of control, but at no point does Pandolfo lose control. 34:40 – this movement reminds me of Bach’s Sixth Suite for Solo Cello, a really lovely and rather moving slow dance. 46:51 – the start of this sonata introduces a melody very similar to the one Bach used in his Brandenburg Concerto no.3 – with a subtle difference as this piece is in a minor rather than a major key, and sounds more serious as a result. Pandolfo and Hunninger energetically navigate the contours of a lively first movement. 52:15 – as slow as the second movement was fast, this Adagio is stretched out almost to its limits by the two performers. This is not an overly indulgent performance though, as they are both trying to extract maximum emotion from the music, often by way of ornaments improvised in both parts. This does lose the rhythmic pulse on occasion. 58:54 – the harpsichord picks out the notes of the main theme, a kind of stuttering melody that the viola da gamba takes up. This is the inspiration for the debate of the rest of the movement. There is a false ending at 1:02:08 where the pair deliberately pause on a ‘wrong’ chord – before finishing more emphatically. This entry was posted in In concert and tagged BBC Radio 3, Carl Friedrich Abel, Johann Sebastian Bach, Markus Hunninger, Paolo Pandolfo, Wigmore Hall by arcanafm. Bookmark the permalink.